A Blog Named Hero Anniversary Blog Hop! Hello! Welcome to my stop on the A Blog Named Hero Anniversary Blog Hop! You should have come from the blog of one of my current team mates at A Blog Named Hero, Donna Idlet, but if you haven't, make sure you check out the post at A Blog Named Hero, where you will find the complete list of hop participants for today. I used Flower Dot Pattern, which I white embossed and then coloured with my Zig markers and lots of water. I have a lot of favourites among my Hero Arts stash, but I keep on coming back to this stamp over and over again. I've had people ask on previous blog posts and on Instagram how I do this technique, so I decided to make a video! GIVEAWAY INFO: A Blog Named Hero is so thankful for our wonderful sponsors and collaborating companies! Several companies decided to help us celebrate our fifth anniversary with giveaways and they were so generous that we decided to spread the love over both hop days with different prizes to be won each day! Giveaway prizes total more than $500! To win, leave a comment on each hop stop. We will select winners randomly from different blogs so the more blogs you visit each day, the greater your chances of winning! And be sure to visit A Blog Named Hero on Sunday for the list of Sunday hoppers and prizes! Comments must be left before 11:59 PM EDT on Tuesday, March 28th and winners will be announced on March 30th. Your next stop on this celebratory hop is Tracy Freeman! Make sure you come back to hop again tomorrow - there will be more guests and more prizes to be won! Wow! Beautiful! I need to try this. The end results are so pretty. Beautiful cards - love the colors and look of them! 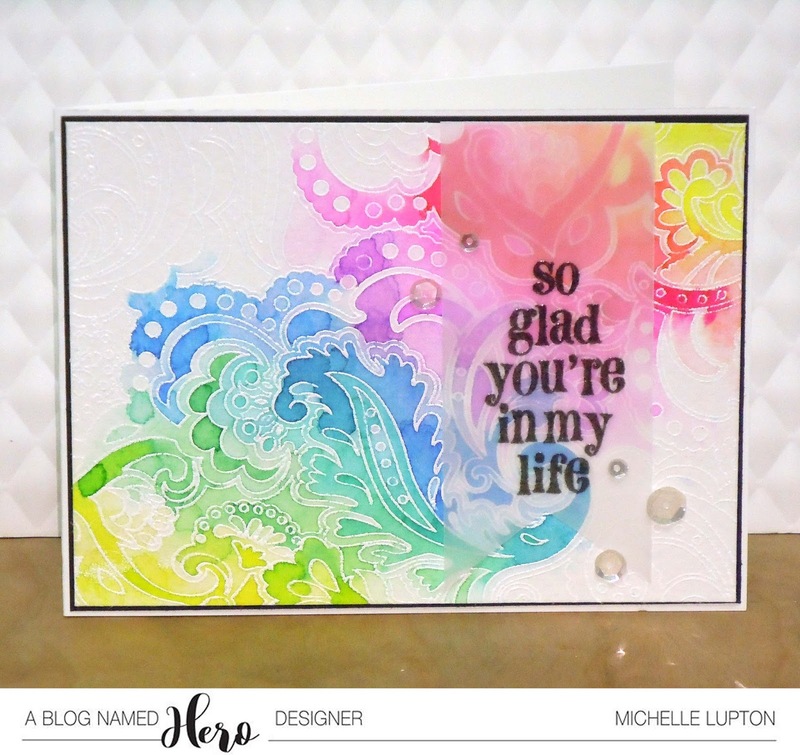 These card are incredible. . .just love the way you used the stamp in each -- it truly is versatile. Thanks so much for sharing this. Your cards are beautiful! I can see why you like that stamp so much, it's so versatile. These are both so pretty. I especially love the colors of the first one and the design of the second. Absolutely loved both your cards. Really wanted to watch your technique video but sadly it was private. Absolutely gorgeous use of colors! You are right, that background stamp is beautiful, and I like how you watercolored it on both cards. Beautiful - the colors and the stamp! Michelle, I just love both of your beautiful cards. I also love heat embossing with watercolors! Thank you! Beautiful cards, wish you had listed name of stamp. Thanks. I just love all the colours you used, the design of these cards reminds me of the sea, even the one card with pink in it (I know, don't say it)! Beautiful stamp and coloring with the zigs. The video would not play for me. I can see "why" this stamp has a "draw" on you! VERY NICE!!! Your watercolor is beautiful. It always amazes me how different each card looks made with the same stamp. Great job! Wow ! Love this design and coloring. What a beautiful background stamp! Your look with the zig markers are so bright and cheerful! Great cards! What a fun bright card. Thanks for the inspiration! Gorgeous cards! Love this technique. Thanks for inspiring. I have to agree that you make the background stamp come to life. Nice job. I love the waterms coloring you did! ! I Love your cards!!! I can't get video to play but I will keep trying because I HAVE to have that stamp and do what you are doing to get that result! BEAUTIFUL!! Seriously I keep coming back to this card! I have to figure out what stamp that is.... I want to do this!! Very nice. I love that technique. I just fall in love with the background, it's obvious that it's your favourite one. Gorgeous colouring. Your cards are so beautiful! I love the colors you used on them. WOW> Really beautiful cards. Love them bot. These are both beautiful! Your backgrounds are just gorgeous. I will have to come back to check out the video---seems it's not working for me right now. Thanks for sharing on this fun blog hop!! Wow! Love the color! and Happy Blogaversary. I love your technique. Was disappointed to not be able to watch your video about how :(. Oh well, thanks for the inspiration!!! The swirl of colors is beautiful. first is bright and colorful. I'd be thrilled to get either one. Gorgeous! Thank you for a video, that always helps me! Beautiful cards! That stamp with watercolor is gorgeous. FYI - couldn't see your video on my iPad, tho. Sooooo pretty! I love this technique. Unfortunately I couldn't see the video as it was labeled as private. :( I will try to find it on Utube! Loving this blog hop and all the talent and inspiration here! Thanks for sharing yours! Happy Anniversary Hero Arts! You had me at rainbow!! Love both cards! They are beautiful! I love that stamp. I've been trying to get a hold of it, but it's retired. I love the colours you used and the technique. I can,t seem to be able to watch the video. It says it's private. Wow! 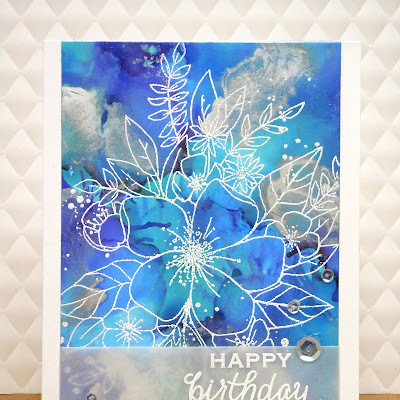 This is a gorgeous background stamp and your watercolouring makes it stand out beautifully! This technique is so artsy and your choice of colours is spot on. Just lovely. Oh WOW!! Both these cards are amazing!! I adore that background! I am such a dud with my Zigs. I try and try but they never look like this!! Beautiful! I love zig markers for water coloring. 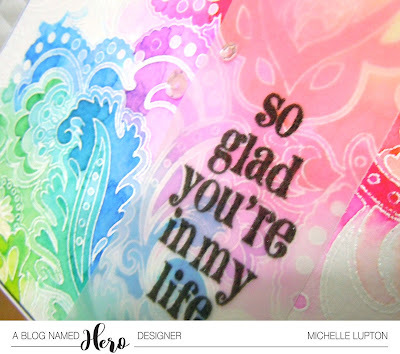 Michelle I love your style and love this background stamp!!! Very pretty! Gorgeous cards! 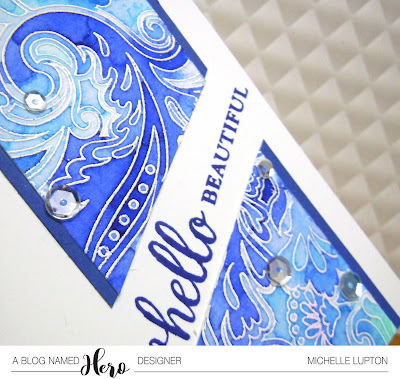 I love the look of the embossing with the blue colors! So pretty! Thanks for the inspiration & great blog hop! These are both SUPER cool! Makes me want to play with the background stamps I have. They turned out so well! Love your card. Is this stamp still available? Really lovely!!! I especially love the colors on the second card. TFS. love them both! Bright, pretty background! I'm really into stencils. Thanks for sharing. Very pretty. What a beautiful card Michelle! Love your color choices of blue...it makes me think of ocean waves...LOVE it! Love the colors you used for both cards. Your cards are beautiful! Thanks for your video and for sharing your technique! Love it love it love it!.. That's about all that needs to be said. Wow! Beautiful!! I love this fun background image alone but your coloring makes it pop and beautiful! It's there now - sorry, it is the middle of the night! So sorry - It's 4:30m here! I just made it public - thanks! It's there now - thanks! Just fixed the video - thanks! It's fixed now - thanks! What beautiful card. I have quite a few background stamps. That I always find intimidating at times. Might give this a try and see what happens. Thanks for sharing!!! I love the colors of the first card. Both cards are gorgeous! I love to do these kinds of cards. I like the color spread on the first card, doesn't overwhelm, but draws you in. And WOW, the vibrant colors of the second and and design are perfect. I love the Hello Beautiful card! I've been looking for a background stamp, and I think I may have just found it. The one us used is beautiful, and your colors are gorgeous. Absolutely love these cards! Beautiful Job! Michelle, wonderful cards. The embossing and watercoloring together make a wonderful impact. AWESOME! Love all the delicate shades! wow, what a beautiful and simple technique. Love it! Thank you for the technique. Thank you for this card. I'm trying to decide whether to purchase the zip clean color markers. Definitely loved your cards!! I also love the bright and softness you can create with the Zig Markers. Yes, it really is a tragedy that we cannot get that beautiful background stamp. I'll be on the lookout for a similar one! Oh, I watched your great video, hope you did some sleep last night. Very nice card. I love the color combination. It's too bad that background stamp is no longer available. Both cards are great! Absolutely gorgeous cards! The blue one is my favorite as I am a blue/aqua kind of gal. Haven't used my ZIG markers very much, but can't wait to try out your technique. Thank you! Your cards are just beautiful! I have always loved that background stamp; however, I neglected to buy it while it was still available. I keep hoping HA will bring it back. Really love the colors of your cards! Thanks for the video! Your backgrounds are gorgeous!!! Thanks for the video! Loved both cards! They are both such beautiful cards Michelle! Like the pretty coloring of the flourishes. I absolutely love both of your cards. The colors are beautiful, and your card designs are perfect. Wonderful technique, thank you for sharing. 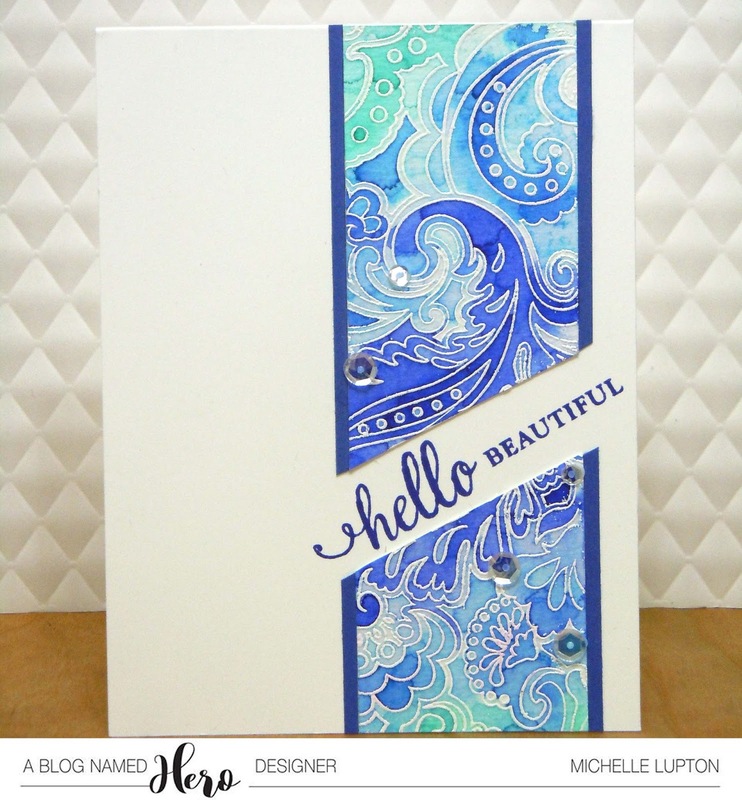 Love the blends of blues - really pretty card! Gorgeous card. Such lovely colors. Both are lovely. I am sorry it is not available anymore. Thanks for sharing and for the video. This is such a fun hop! Stunning cards. Loved your video. I can see why you keep coming back to this stamp, and your coloring choices really make for wonderful cards! The cards are both gorgeous and I am so happy you made a technique video showing how you achieved those gorgeous results. I will def try this and I wouldn't have without seeing you do it. I also hope you start making videos again. You are a hoot!! OMG! What awesome cards. Love the watercolor effects. Love the card, so happy you made the video. Love the rainbow card. I'm going to break out my zigs!! These are gorgeous cards! Love the colors! Bright and colourful striking cards! I would never have thought it was seriously that easy! Maybe with traditional watercolors, but scribble with Zigs and spray?!? I don't know whether to finish the blog hop or run to the craft room to play!!! Thanks for demystifying the technique! The colors are beautiful. I love this technique. Thank you for the video showing how to use my Zigs to create beautiful backgrounds. These cards are spectacular. Love those blues on your second card. I need more Zigs. I can totally understand why you love this background so much. Thanks for the video. This is my first time watching one of your videos, and it was awesome. The card is beautiful and such great ideas you told. Thank you. Do it! I ummed and ahhed for ages before getting my Zigs - now, I use them so often, I don't know what I would do without them! These cards are stunning! Lovely work. WOW love this technique, your cards are great! Lovely cards!I love how vibrant the colors are! Your card is so beautiful Michelle, love that stamp! Your video was so much fun, and I loved the technique. I will definitely be giving this a try. Great card design. This is my first visit to your blog, but it won't be my last. Thanks for sharing your talent. These are so pretty, especially love the watercoloring. Wonderful cards; I love your mastery of color! Paisleys can be so timeless; color choice really changes the visual impression they make. Thanks so much for making that video. Putting the strips of paper on the sides really cuts down on the bulkiness of the card. The colors you used are my favorites too. Great video Michelle! You've enabled me to try this technique! My Zigs have been dormant for too long! Beautiful choice of colors. So inspiring. Love those cards. Well done! Gorgeous card! Your video was awesome! I will be trying your technique. I can see why this is a favorite stamp of yours. So versatile and great with lots of swirling color like you did here. Love the use of watercoloring with that beautiful stamp. Wowzer! Oh my gosh, Hero Arts needs to bring back this stamp! Thanks so much for sharing how you made this card. It's gorgeous. these are stunning - so colorful. Gorgeous cards!!! 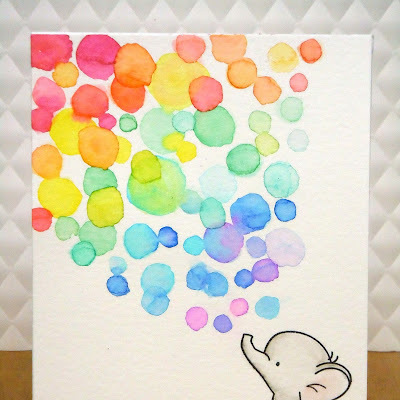 This background stamp is next on my list! LOVE it!!! Thank you so much for sharing these cards with us!!! Holy WOW!!! Loving the colors of your cards. The clean simplicity is stunning. Fabulous blog hop!! Both cards are so beautiful, Michelle! Love the rainbow colours on the first one. Love your card and thanks for sharing how you made your card. Wow, wow, wow! I understand why you refuse to let go of this background stamp, it's gorgeous! I love the blue/green color combination, too! I also love this background stamp and wish they would bring it back. Your work is so, so pretty!!! Love your cards and that stamp set!! So beautiful! I love them both so much! That stamp is gorgeous! Wish they still sold it!😭 Thank you for sharing your beautiful cards! This is my first visit to your blog, I'm going to come back to visit soon! Can't wait to see what all you've created. Beautiful cards, both in the designs and the coloring! 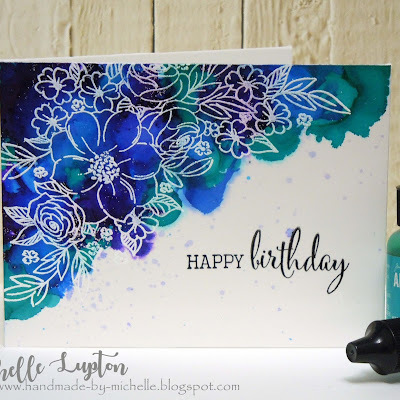 Beautiful ways to use a background stamp! Love that - so glad you're in my life, stamping products! Congrats ABNH! All of these cards are so beautiful! Oh, and gee thanks for making us love a stamp that's been discontinued! But thanks for the video. Gorgeous designs Michelle! Love the color combos for both cards, thanks for sharing! That stamp is gorgeous. Thanks for the video - love your style! I would have thought that both cards had the same stamped background. They're both so beautiful and yet so different. Thank you for sharing your work. Love the way you colored the background with the markers. WOW! Thanks for sharing these cards soooooooooo LOVELY. Gorgeous cards you have created! Gorgeous cards and the colors!! I love both your cards. Thanks so much for including the video, it's very helpful to see your technique. What does this fox say at A Blog Named Hero?